The prompt over at dVerse Poets Pub today is to write a poem inspired by the art of Danny Gregory. 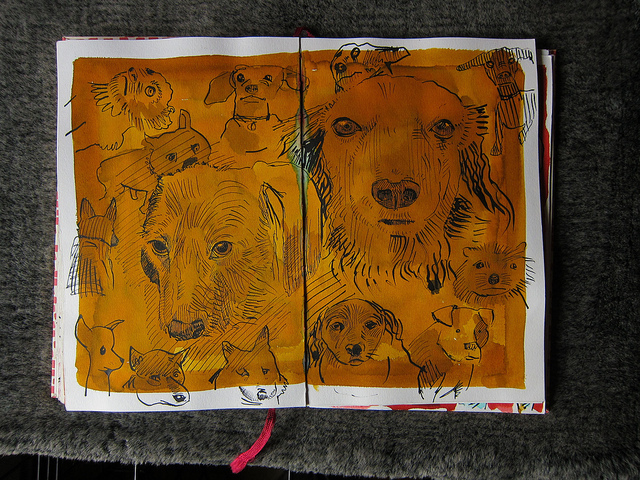 I picked one of Danny’s sketches that appealed to me because it was of dogs. I love dogs! This entry was posted in Poetry and tagged Bible, Danny Gregory, Dogs, dVerse Poets Pub, Faith, God, Hope, Life, Love, Poem, Poems, Poetry, Unconditional love. Bookmark the permalink. I have been thinking a lot about unconditional love lately! What a God! God bless you! Yes, God and dogs certainly offer us unconditional love! Excellent! Friends tell me that the dog/human connection is akin to what I see as my relationship with God. How different the world would be if we had a tail, and couldn’t hide our emotions… Maybe there are unconditional love we never see because it’s so hard to detect in humans. Oh I didnt see this sketch of dogs. It is wonderful. I chose another – because it was a dog – and wrote about their devotion as well. So of course I REALLY love this poem! Dogs give an unconditional love that no one else can…. So true Linda, beautifully stated. … if that isn’t the truth… my Golden insists on bringing me something when I return… now only if he’d quite circling the car as I back in! Great poem, Linda! Unconditional love, whatever the form, is a great thing to have in one’s life. One of the most amusing quotes that I have ever read on Facebook was something like: “If you have teenagers, get a dog. At least someone will be happy to see you”. right and right… I don’t believe God condemns anyone – regardless of sexuality – he loves all… very tough to find unconditional love among us humans…. The contrast between the dog and the Good Book – excellent. A dog is always so glad to see us and yet, our God even more so. I wish my dogs could read this. They’d smile. I’m always amazed at their joy at the simple sight of me. You are right on both counts, Linda….wonderful sketch choice, and yes I agree that dogs definitely unconditionally love…..they are always glad to see their master and show it with the excited tail wags..